It is the comic singer who gave Music Hall its distinctive voice and Arthur Lloyd specialised in funny songs. He used very clever 'play on words' in his lyrics and this song is a good example. He is singing about a large (whopping) dog, born in Barking who belongs to a fireman in Wapping, thus, the '...Barking dog of Wapping or the whopping dog of Barking...'. 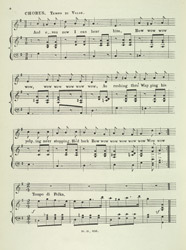 The song is complicated more when in true Music Hall fashion the singer is heartbroken when the girl he loves is rescued by the dog, only for her to fall in love with the fireman who owns the dog.